﻿ Trend Of The Week: Bathroom Lighting Fixtures! Trend Of The Week: Bathroom Lighting Fixtures! A new week of work is starting, and nothing better to start off with some inspirations! This Monday, we bring you the best bathroom lighting fixtures! Bathrooms are usually a forgotten room, when we are talking about the latest design trends. However, it is very important to have a cohesive home décor, including the bathroom. Today, we’ll show you our top bathroom lighting choices, so you can have the desired lighting effect! GET INSPIRED: What Is Hot On Pinterest: Mid Century Bedroom Ideas! Purple, the color of luxury. This is a great example of how a lighting suspension lamp can definitely change your bathroom modern décor. This is feminine, yet luxurious decoration, and this unexpected lamp completely transforms the environment. Clark Suspension Lamp is one of DelightFULL’s pieces, that belongs to the Heritage Collection. It is a very iconic piece, and we understand why! All the curves leave us completely mesmerized! This mid-century lamp is handmade, which means that you can choose a different size, finish, and, how curvy you want your lamp to be! Black and Gold are always holding hands, when we are talking about a luxurious and classic décor. This is a great example of how a bathroom can be the center of attention of a house! The marble wall, combined with the golden sinks and wall lamps were very well chosen! Brubeck Wall is a handmade brass lamp that suits almost every single bathroom décor, or even other room of your house. It is like art deco and luxury finally met! You can also change the finish of your lamp and which size you want your wall lamp to be! If you are a mid-century lover, this decoration is just for you! Matheny chandelier was not an obvious choice, however it transforms completely the plain bathroom décor. Mid-century style is all about clean lines, neutral colors and some shiny elements to light up the room! Matheny chandelier is a new take on the mid-century classics, and it is definitely driving us crazy! It has a geometric design of combined tubes and its structure is handmade in brass. 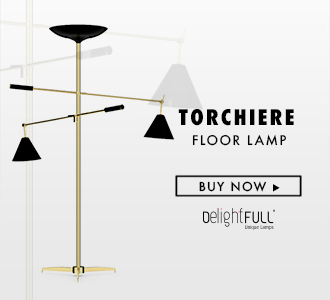 Its shape is round and is composed by golden tubes, which reflect the sophistication of a timeless iconic lamp. This is another great example of how a mid-century bathroom décor should be! Add some retro or vintage design accessories, keep it simple, and “seduce” your guests with Charles Lamps! Charles Wall Lamp is handmade in brass and aluminum, and it is screaming mid-century design! The minimalistic perforation details bring us back in time to the fifties, and we are sure that you won’t resist the mid-century classic! A bathroom totally in marble! This is every design lover’s dream – being able to have a room filled with the latest design trends. Marble is one of the top choices, when it comes to materials used in 2018! See how the mid-century round mirror and wall lamp with an astonishing lighting effects, transforms this bathroom into one modern and sleek design space! Galliano Wall is one of DelightFULL’s best sellers. Its minimalistic design suits almost every single room, styles and personal tastes. The best part is that it has a peculiar lighting effect that adds a special glow to your modern house. It is handmade in brass, and you can choose a color, or even a finish! A bathroom that will makes us feel that we opened the door directly to Palm Springs. This modern, and tropical style is one of the latest trends, and your beloved bathroom deserves the best of the best! Add some plants, some greenish- blue colors, some mid-century accessories – that, at first sight you would never put in this particular room of the house – and be bold! Hanna lamp is an appealing aluminum bell lamp, handmade in Portugal, by talented artisans. It is also customizable, so it means that you can choose between a wide range of colors, both matte or glossy version! GET INSPIRED: Get To Know The Entire Family Of Brubeck Lamp!